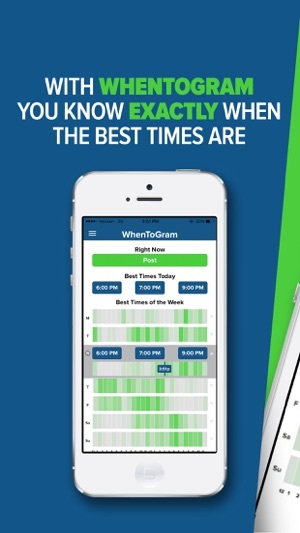 How does WhenToGram know when I should post? Simply log-in with your Instagram credentials. 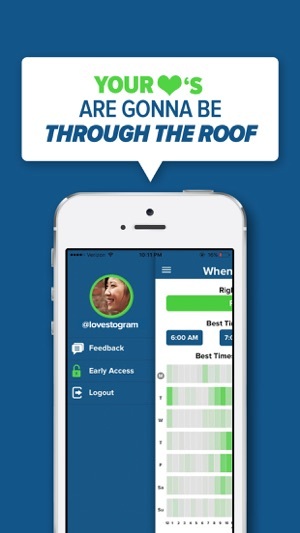 With your permission, WhenToGram anonymously analyzes the activity patterns of all your Instagram followers and turns that information into actionable insight. What does WhenToGram do after the analysis? The app generates a heat map with details on when during the day is best to post to Instagram, based on when the largest amount of your followers are browsing their Instagram feeds. You can see each day of the week, and get hour-by-hour analysis by tapping on a specific day. See our screenshots for a more visual explanation. How will WhenToGram help me? 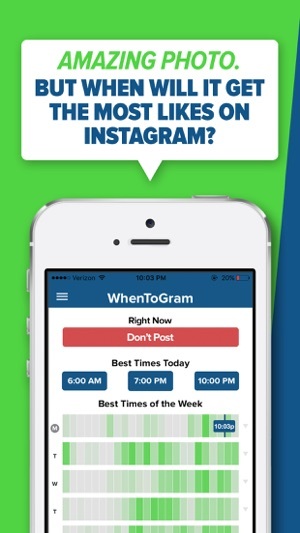 At it’s core, WhenToGram makes it easy for you to reach the largest number of followers with every photo you post. Open the app, and it will tell you ‘POST NOW’ or ‘DON’T POST’. It’s simple and useful! Want to know the Top 3 times for you to post on Instagram today, tomorrow, and every day this week? 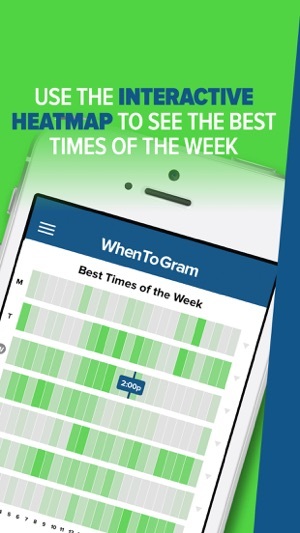 Download WhenToGram today! Please email hello@whentogram.com - we would love to hear from you. Fix for users who were always seeing the same times 12:00am, 1:15am. Please uninstall the app and download the latest version from the App Store. Downloaded because it was recommended by YouTuber Sunny Lenarduzzi. Having a hard time believing now she really uses this empty app. I’m still going to give it a try for a full week but so far I posted at their recent times and it’s been the worst performance in weeks 😂 . Also they don’t concur with other stats apps/website. Oh speaking of website and support: inexistant. So do their FAQ section and empty Pro Tips section. Their notifications section is full of typos/bugs. If you still want to give it a try, stay with the free version. The upgrades don’t give you more “in depth info”. This app was recommended by Jenna Kutcher. While I adore her, I’m extremely disappointed with this app. It’s completely inaccurate. Instagram shows the majority of my audience being from the United States, which makes sense because that’s where I live. It also shows my followers being most active during the hours of 9am-6pm every day. This app tells me to post in the middle of the night! It’s not helpful whatsoever. I’d like my $3.99 refunded to my card immediately. I downloaded this app after a suggestion from Jenna Kutcher who is HUGE in the social media world.